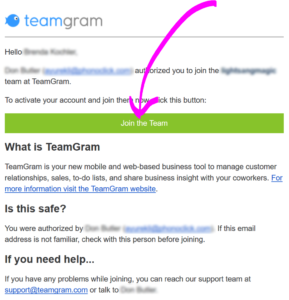 To become a TeamGram user of your company, you must be invited by an administrator. Click on the link in the invitation and follow the instructions. If you are an administrator, read the Administrator’s Guide to learn how to create your company account and invite your users. Your company’s records in TeamGram can only be accessed by authorized users (your team members). You can only become a team member of a company, if an administrator of that company invites you. The first person to create a company’s TeamGram space automatically becomes that company’s administrator. The administrator can then invite new users, and even appoint other users as additional system administrators. If you are an administrator, check out the Admin Guide to learn how you can invite your coworkers to your TeamGram space. User invitations are delivered via email to your work email address. If you received an invitation in your personal (non-work) email address, you may want to ask your administrator to resend it to your work email. This is important, because this address will be used when you send quotes and other messages to your customers. The invitation email will also show the email address of the administrator who issued it. Please check this before you accept the invitation. Do not accept an invitation if it is issued from an email address you do not recognize as an authorized person in your company. Your invitation email includes an activation link. Click on that link and fill out the required information. You will be asked to create a username and password. Your administrator does not have access to your password, and cannot set it for you.